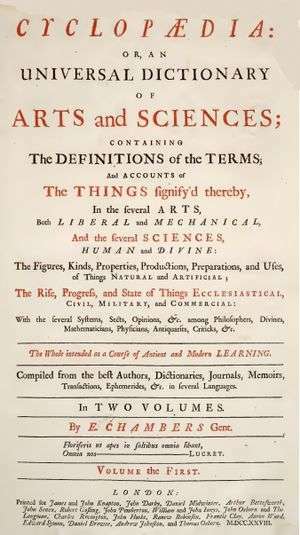 Ephraim Chambers (c.1680 – 15 May 1740) was an English writer and encyclopaedist, who is primarily known for producing the Cyclopaedia, or a Universal Dictionary of Arts and Sciences. Chambers was born in Kendal, Westmorland, England. Little is known of his early life, other than that he was apprenticed to a globe maker, John Senex, in London from 1714 to 1721. It was here that he developed the plan of the Cyclopaedia, or an Universal Dictionary of Arts and Sciences. After beginning the Cyclopaedia, he left Senex's service and devoted himself entirely to the encyclopedia project. He also took lodging in Gray's Inn, where he remained for the rest of his life. Chambers died in Islington and was buried in the cloisters of Westminster Abbey. The first edition of the Cyclopaedia appeared by subscription in 1728, in two vols. fol., and was dedicated to the king. In addition, Chambers wrote for, and possibly edited, the Literary Magazine (1735–1736), which mainly published book reviews. Chambers worked on translating other works in French on perspective and chemistry from 1726 to 1727, including the Practice of Perspective from the French of Jean Dubreuil. He also worked with John Martyn to translate the History and Memoirs of the Royal Academy of Sciences at Paris (1742). The Encyclopédie of Diderot and d'Alembert owed its inception to a French translation of Chambers's work. Chambers's Encyclopaedia A work by different authors. ↑ Espinasse 2004, Britannica 1911. Bradshaw, Lael Ely. "Ephraim Chambers’ Cyclopaedia." In: Notable Encyclopedias of the Seventeenth and Eighteenth Centuries: Nine Predecessors of the Encyclopédie. Ed. Frank Kafker. Oxford: The Voltaire Foundation, 1981. 123–137.